The most frustrating problem I had in beer making must be the head. I tried my best to copy a successful recipe as good as I possibly could and when the beer was finished I would be very disappointed by it. I would pour the beer in a glass and foam would appear. But then, the small bubbles would turn in big bubbles and within minutes they would collapse and the beer would look as if it had been standing there the whole evening. The soul had disappeared. In Dutch we literally call it “dead”. I had no idea why it happened because I did everything according to the recipe. So It was time to find out what went wrong. And I found some information that was very helpful. I normally don’t like copying information without testing it but I think that the information I found was pretty good. First of all I found that there are positive and negative influences on the head. And that the negative influences are much greater than the positive. For example: A perfect beer in a “dirty” glass will always result in disappointing foam. So what happens when you pour a beer? First foam forms. I guess that usually this is not a problem When there is CO2, bubbles appear and they drag beer up to form bubbles. After that the beer drains down between the bubbles and the foam starts to dry. Then the foam should be strong enough to remain. Some kind of structure should form to keep the bubbles small and strong. If there is something wrong the small bubbles will not be able to sustain themselves and collapse, forming bigger bubbles that will also collapse. It’s like watching your work being destroyed without being able to do anything about it. A dead beer is a sad, sad sight. So what are the things that attack our beloved heads? Higher alcohols. When we talk about alcohol we usually mean ethanol. Ethanol has 2 carbon atoms. Higher alcohols have 3 or more. A strong beer contains more higher alcohols and this has a negative affect on foam. Esters. Esters are formed by acids and alcohols. Stronger beers contain more acids and alcohol and therefore again they have more problems with foam. The biggest influence are lipids: Fats, oils, wax, sterols. Drinking a beer while eating cheese is killing the beer. The best advice is to clean your glass with hot water and rinse it thoroughly to get rid of soap residues. Mashing. Malts of the past needed more steps in mashing. These steps were needed to break down proteine chains. If you do this with “modern” malts the proteine chains are broken down in small chains that cannot sustain foam. So it is advisable to start with a mashing temperature of at least 60 C. In case you use a high percentage of unmalted ingredients you may need to start mashing at a lower temperature. Boiling too long causes alpha acids to be removed from hop. These acids are a positive factor in head retention. Boiling longer than 90 minutes should be avoided. For other reasons you should not boil less than 60 minutes. And what can be done to improve our head? Hops. Isomerized alpha acids have a positive effect on foam. So a beer with enough IBU’s has a better chance of a good head. Malts. Cara malts contain longer proteins and do not contain enzymes anymore to break them down. Racking. Remove the wort from the yeast after the first fermentation stage is finished. Dead yeast may fall apart and enzymes will form that break down the protein that are helpful for the head. Shake the bottled beers 2 weeks after bottling. I am not sure if it is a myth or truly helpful but the idea is that shaking the bottles dissolves the CO2 in the neck back in the beer. I am merely an amateur and do not have the intellectual background to explain all the above. I doubt that there is any person on earth that possesses so much knowledge. I gathered these tips and translated them in “normal people language” because I found them helpful and I hope that it helps to give you a healthy head. P.S. 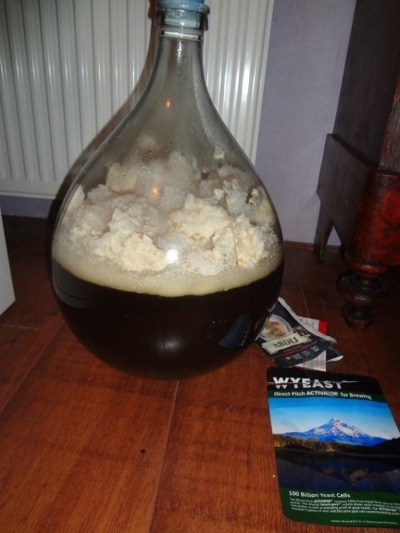 Visit our shop: Leven in de Brouwerij.